The program is mainly open to growing businesses in the following aera : agri-food, health and well-being, digital, energy and cosmetics. You are accompanied by one or several mentors. They advise you on different technical aspects according to their expertise. The program, which lasts 12 months, is adapted to your needs and professional constraints. You will benefit from tailor-made thematic workshops to achieve your strategic goals. FFWD Normandie brings you the expertise in the fields of governance, development, operational strategy, digital transformation and human resources. Following the kick-off scheduled on January 10th 2019, you’ll benefit from a diagnosis 360° realized by the FFWD team and mentors. An annual event during which you pitch your company to potential investors and clients. 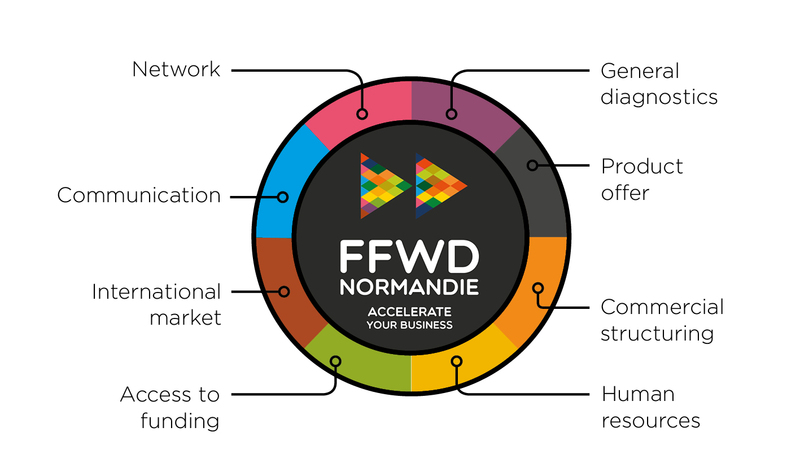 During the acceleration phase (6 months), you are guided by one or several mentors and accompanied on technical aspects by partners of FFWD Normandie in their areas of expertise. Our mentors, well-known professionals, help you to build a strategic vision as well as to expand to new markets and to integrate efficient professional networks. During 12 months, you will benefit from an acceleration program adapted to your work rythm and to your constraints. Workshops will be organized to help you to boost your sales and to reach new markets (2 half-days per month). How to improve the interactions between different cultures in an organization in order to maximize the benefits of differences?